I was watching a DIY reno show the other day and the decorator removed a perfectly good ceiling fan! It tore at my heart! I don’t know if ceiling fans are in or out and, frankly, I don’t care. All I know is that I love sleeping in a bedroom with that ever so light breeze wafting across my face……..so I assume everyone feels that same way. That’s why EVERY bedroom in our house has a ceiling fan. Well, after finishing 3 bedrooms downstairs, the budget had been consumed, and I mean, drained, exhausted, DONE. But, I NEEDED my ceiling fans. So, I went to WalMart and bought a $15 (no kidding….I think the same fan now sells for about $20) ceiling fan. Brassy and cheap looking (wonder why? J). Anyway, I went to a paint store, Kwal’s, I think, and bought some patina aging agent and some copper paint (it comes in a bottle more like a craft paint would.) I went into the store with 20 bucks and came out with change. 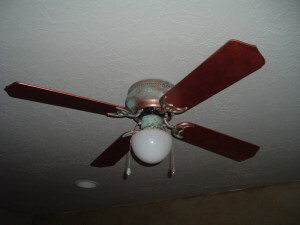 I painted the blades of the fan with the copper paint (you have to be a little careful with this, as you need to paint in the same direction once you begin painting to achieve the desired result. I practiced on a piece of old sheetrock we had laying around…very easy and fun to use). 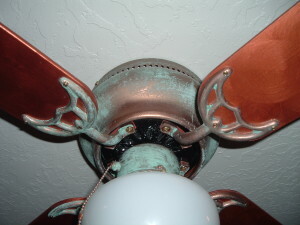 I used the patina aging agent on the brassy fixtures, and………..voila! My cheap-o fan turned out great! 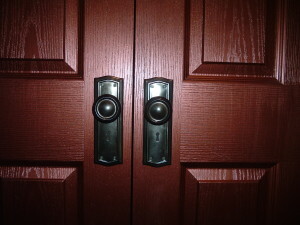 After doing the fan, I went a little “copper crazy” and painted his closet doors, too. LOVE IT! The old doorknobs were an antique find on a road trip…….keep a look out for cool stuff to do cool stuff! Here are the doors. This would not work in every room, and it may not be someone else’s style, but it really works in this room, I love it! 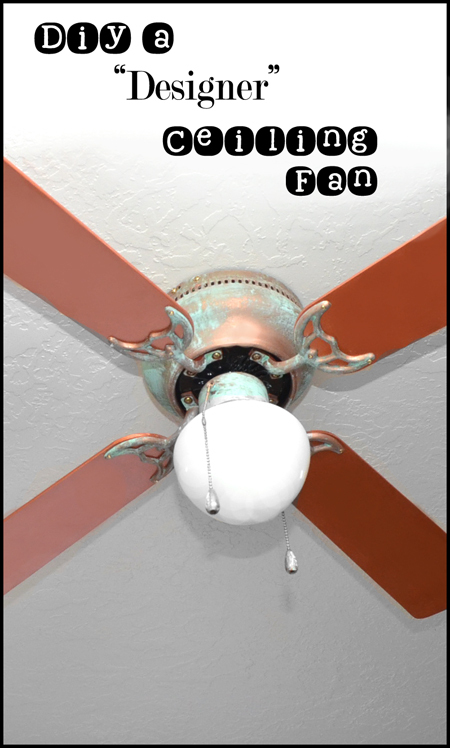 A few years ago, I mentioned to my husband that we needed to paint an old brass ceiling fan and he thought I was crazy…thinking you couldn’t do that. Well we did and it looked fabulous. Your fan looks great too. Love the door as well.